We exist to help people, who have suffered a debilitating accident or significant illness, back to optimal functioning. 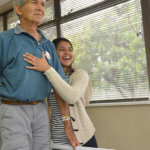 Aurora Hospital is a leader in rehabilitation care in South Africa. We provide physical rehabilitation and subacute inpatient and outpatient care for people challenged with a wide range of disabilities caused by disease or injuries, including: Strokes, brain injuries, spinal cord injuries, major joint replacement and fractures (hips, knees and shoulders), debilitating neurological illnesses (e.g. Parkinson’s, Multiple Sclerosis, Guillain-Barré), amputations, trauma (major orthopaedic trauma), palliative care and ventilated patients. 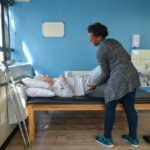 Our modern facility is located in Walmer Downs, Port Elizabeth, in close proximity to the major private and state acute care hospitals with 55 beds (single and double rooms) and a five-bed high-care unit. The facility is designed to promote rehabilitation efficiency, enabling our staff to create a safe, supervised and structured environment for our patients. Our team of professionals work together to design, implement and monitor a rehabilitation programme that meets each patient’s specific needs. The patient’s family is as important as the patient. Throughout the patient’s hospital stay, we conduct progress meetings with family members to educate them in proper care practices, to ensure patients receive a consistently high standard of care, even after discharge. Our objective is to maximize recovery and patient health gain while achieving the highest level of independence for each of our patients, as cost effectively as possible. Our doctors are highly experienced and are driven by the conviction that the best outcome is reached by clearly understanding the needs and wishes of our patients. Their aim is to ensure that their team, with their equipment and systems, all work together to deliver the best outcome. Patients undergo a combination of specially designed therapy sessions to suit their specific needs. Patients receive up to two hours of intensive therapy per day and, depending on their medical condition, will include home and life management skills training. We offer hydrotherapy in our indoor heated pool, occupational therapy in our gymnasium, workshop and kitchen, while physiotherapy is catered for in our specialised physiotherapy gymnasium. All equipment needs can be catered for, and we provide comprehensive outpatient care after a patient is discharged from our care. Meetings are held with the family members, doctor, nurse, occupational therapist, physiotherapist, speech therapist, psychologist and the social worker of a patient to discuss the initial assessment, rehabilitation goals and discharge planning. The family meetings provide a platform for the involved parties to discuss a patient’s diagnosis, the team’s goals for a patient, and any challenges or barriers that may be faced, up until the time the patient may be discharged. Home carers or a patient’s family will be trained prior to discharge to help a patient continue with daily activities at home. Work assessments form part of discharge planning in order to determine whether a patient will be able to return to work. Staff will also assist in making arrangements in the case of the patient being unable to return to work. At the heart of Aurora Hospital lies its experienced and expert interdisciplinary team: the people who work closely together to meet the needs of each Aurora patient to produce excellent results. The full-time team consists of two medical practitioners, six physiotherapists, five occupational therapists, two occupational technicians, two speech and swallowing therapists, a social worker, a psychologist, two medical orthotists and prosthetists, and rehabilitation nurses with extensive experience in rehabilitative, medical and therapeutic services. In addition, the part-time support team includes biokineticists and a dietician. Rehabilitation doctors are primarily responsible for your rehabilitation programme and overall medical care. Nurses help you with difficult tasks and help you practice what you learn in therapy. Therapists including Psychologists, Social Worker, Speech Therapists, Occupational Therapists, Physiotherapists and Dieticians are responsible for the practical activities of your rehabilitation and help you to regain your ability to perform daily activities. Rehabilitation Programme Managers that will assist in the planning and implementation of your discharge arrangements and act as emotional support for a patient’s family. Case Managers who liaise and negotiate with your medical aid scheme or funder prior to and during your hospital stay. Originally from Port Elizabeth, he completed his undergraduate studies at the University of the Free State. Thereafter, he completed his internship and community service years at the Port Elizabeth Hospital Complex and has been part of the Aurora team since February 2017. We are thrilled to have him as part of our team. A general practitioner at Aurora hospital since July 2018. For the previous 6 years she has worked at Chris Hani Baragwanath hospital in the internal medicine department. She did her internship at Dr. George Mukhari hospital in Garankuwa and completed her community service at Barberton – a rural hospital in Mpumalanga. We consider ourselves lucky to have her as a part of our team. A Family Physician with a background in HIV Medicine. She joined the Rehabilitation team at Aurora Hospital in March 2016. The knowledge and experience in the field of neurorehabilitation is very stimulating, managing various patients and their different conditions. She has grown to enjoy it and look forward to becoming better at it every day, touching the lives of patients and their families.